Halloween Beauty Bits - Tried & Tested! 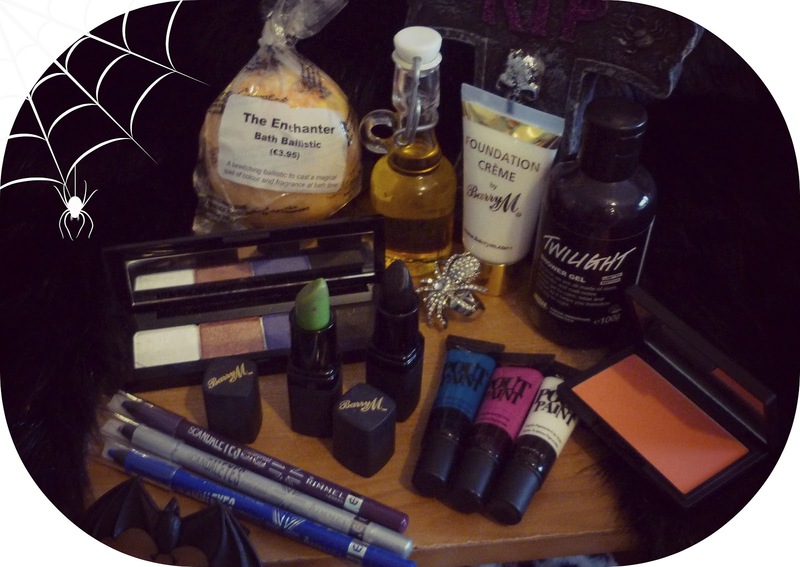 What better way to start the Halloween week, than by reviewing a heap of Halloween-perfect beauty bits? I recommend all of the products featured in the post, and hopefully you see something that'll catch your spooky eye..
Lush The Enchanter Bath Ballistic (€3.95): This gorgeous bath ballistic transforms your bath water into bright pink and orange swirls, and fills your bathroom up the oh-so famous Lush scents! The bath ballistic contains lime oil, neroli oil and frankincense - all beneficial to the skin, and are also known to brighten your mood. The scent actually lingers on your skin for a while after your bath, whilst leaving the skin feeling really hydrated and moisturised. Head into your nearest Lush asap, and pick one of these guys up for a Halloween pamper sesh - it's gorgeous! Lush Twilight Shower Gel (€5.50): When I heard one of my favourite bath ballistics was going to be made into a shower gel for Halloween, I squealed with delight! The lovely Twilight shower gel contains bedtime-perfect essential oils such as; lavender and ylang ylang. The scent of this shower gel is definitely not for everyone, but after a few uses I began to love it! (I definitely prefer the bath ballistic version though.) It's ideal to use before bedtime, as it really does calm and set you into a mode of relaxation. Shu Uemura eyeshadow palette: Whilst looking through my makeup stash, I spotted this eyeshadow palette immediately with its Halloween-perfect colours. The pigmented purple, orangey-copper, white pearl and shimmery black shades are ideal for the season, and are great alternatives to use if you're not going all out with a fancy dress costume but want a seasonal makeup look. They're all shimmery shadows, that would suit most skin tones. Unfortunately there's no information given on the packaging for this palette, but the colours are quite recognisable! Barry M Touch of Magic (Green) and No. 37 (Black) Lipsticks: I've owned both of these Barry M lipsticks for years, and found they're both ideal for Halloween use in particular. The brand's famous Touch of Magic lipstick is a green colour in the tube, but turns to a pink pigment the minute it touches your skin. It turns to whatever pink shade is a perfect match for your own skin tone, and it turns out a different shade on everyone! It's one of the more moisturising lipsticks from Barry M, and lasts long on the lips - even my Nana's a fan, and has been using it for years! Barry M's black lipstick is the only one I own, and it's by far the best affordable one you can get. It's highly pigmented and not too drying. I would suggest wearing lip balms under Barry M lipsticks, as I find they can be quite drying on the lips! 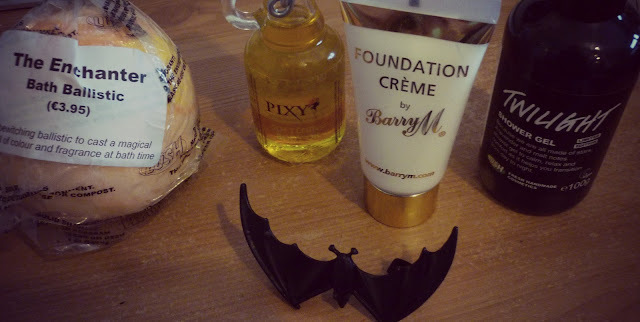 Barry M White Foundation: I picked up this White foundation in Topshop, when I was in London last month. It's a fantastic product to mix in with darker foundations if you're pale like me, but it's also brilliant to wear on its own for Halloween! I used it recently in a Wednesday Addams makeup tutorial for Company magazine's new iPhone app, and it completed the look brilliantly. It's a better option than white face paint to use, as I find that face paint can break you out and irritate the skin. Sleek Pout Paints in 163, 154 & 153: I bought these Pout Paints off of Cloud 10 Beauty last year, and I love them! 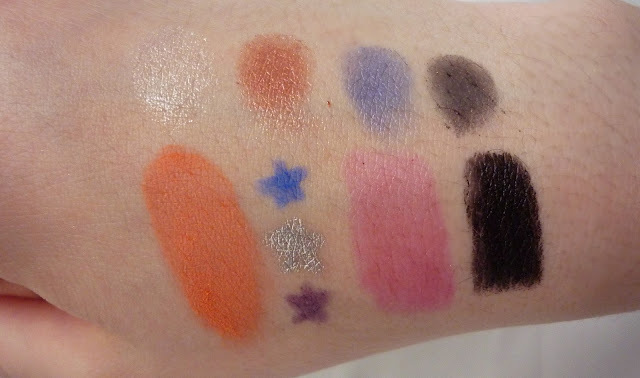 They're similar to OCC Lip Tars (U.S beauty gurus love them), they're gorgeous lip pigments that can be mixed together to create unique lip colours. You only need the tiniest squirt of these pigments, to mix in with one another and they last for quite a while on the lips. They're moisturising, and leave a glossy finish - although you can mattify them slightly by tissue blotting! The only downside about these is that you need to bring them out with you and mix them up again, to reapply colour! If you're a makeup artist, Pout Paints are a must-have; Sleek have a heap of colours in the range and you can create any shade you like with a handful of them. Rimmel Scandaleyes Eyeliners in 013, 010 & 014: Another few products I got in London last month, which I received at a Rimmel bloggers event. These creamy eyeliners are a dream to use smudged into the lash lines, but also to use as eyeshadow bases. The blue, silver and purple shades are perfect for Halloween, to add a bit of colour to a makeup look or to draw on facial designs. Unfortunately, I think they're hopeless to use on the waterline as no pigment comes out. Shu Ueumura palette swatches on top. Bottom row (L-R) - Sleek blush, Scandaleyes eyeliners and both of the Barry M lipsticks.